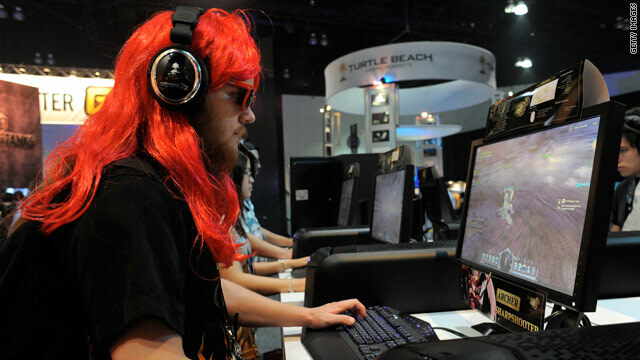 If your video game's sound doesn't add to the experience, why spend money on headphones and a wig? When is the sound of a shotgun blast not just a shotgun blast? When it is paired with 14 other sounds, including a roaring lion and an object being sucked through a tube. Sound and sound effects in video games are just as integral to the overall game experience as a good soundtrack is for a motion picture. And gamers are demanding more realism from their games and sound effects are crucial to the experience. Whether it is a weapon blast, a fantasy creature screaming, or simple handslaps on a railing, the sound directors are searching for the right mix of sound to link gamers to the game. Simply recording a gun shot or a footstep won’t work for an effect that could be repeated dozens of times throughout a game. A typical videogame sound, for example, a shotgun firing, doesn’t sound particularly exciting; it is just a short concussive blast. But in a video game, that shotgun could be close or far away. The sound needs to reflect that, said Chris Sweetman, sound director for Splash Damage. Sounds can be triggered from so many different sources in a game and it is important to provide audio depth, says Gene Semel, senior manager of the sound department at Sony Computer Entertainment America. Semel, who has worked on numerous blockbuster franchises, including “God of War” and “Uncharted”, said technology advancements in the game consoles have increased expectations from the gamer. He points to the PlayStation 3 improvements including 7.1 surround sound, more memory and better data compression. Both said the development in sound in video games has been driven partially by technology advancements, but also partly by gamers who want more realism from their experience. For Sweetman, sound creation in games is not much different from when he started creating sound in the film industry many years ago with his father. However, he points to repetition as the biggest difference from film sounds versus game sounds. Developing sounds to mimic those expected in the real world requires sampling many different sounds, then figuring out how to put them together to make them become “hyper real,” as Sweetman described it. Putting that all together and then figuring how it plays out in the game starts very early in the development stages. As much work as it is to mimic sounds that exist in the real world, creating sounds for things that never happen naturally is even more difficult. Fantasy games, like “God of War” or “Dead Space,” require sounds that must be imagined first, but also have some grounding in the real world. Sweetman and Semel agree that fantasy sounds are the hardest for their teams to develop. Both men said it is tricky to make the sound believable without making it sound like something that already exists. Regardless of the type of aural effect they are aiming for, sound designers want their work to flow seamlessly and in concert with the game. How much gets noticed by the player depends on the effect the game designers want. Semel said if they have done their job right, the player does not notice the sound, but is immersed in the overall experience. However, Sweetman disagrees when it comes to first-person shooter games because the weapon is the lead actor. Interacting or grounding the game character in the world with sound is vital in some types of games, according to Sweetman. While working on the “Burnout” franchise at Criterion Games, he said one of the most important noises in the game was tire noise. It’s the small noises like sound of a moving tire that, when missing, become most noticeable. But add them in and it gives flavor to any scene. In gaming, the right sound effect can make or break the experience. “The player needs to have this empowerment, a sense of size, a sense of scale and a sense of power. We need to be able to give it to them,” says Sweetman.